Which type of espresso machine should I buy? The espresso making process involves forcing hot water under pressure through compacted coffee. Control of this process greatly effects espresso quality. 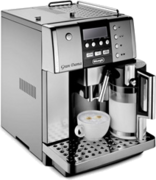 The major difference between the various types of espresso machines lies in which parts of the process the user can and must control skillfully to produce a high quality cup of espresso. Note that while coffee bean grinding and tamping skills are normally a part of the espresso making process for Manual Lever, Semi Automatic, Automatic, and Steam Espresso machines, most machines in these categories will instead accept an Easy Serving Espresso (ESE) packed coffee disk or pod with a paper filter cover. No skills required (or accomodated) as the machine controls all steps in the espresso making process. If the grind is too coarse, the espresso will be watery. If the grind is too fine, the espresso may "burn," resulting in a bitter taste. An ESE pod can be used to eliminate the need to grind the ground coffee. Tamping should be with about 30 lbs of pressure. The compacted coffee formed by tamping is known as a "puck". An ESE pod can be used to eliminate the need to tamp the ground coffee. A single shot of espresso takes 25 to 30 seconds to extract 1 to 2 ounces of espresso. This is measured from pump start time until the time at which the targeted amount of espresso is achieved. If less than 1 to 2 ounces are to be extracted then use a lighter tamp or a coarser grind; if more than 1 to 2 ounces, use a heavier tamp or a finer grind. The optimum water temperature 190 to 200 degrees F.
It can take 5 to 6 minutes for machine to achieve this level from a cold start. The ideal water pressure is 8 to 9 bars, some machines advertise 15 to 19 bars but this is a maximum capability. More pressure does not mean better coffee. This pressure can be inferred from the extraction time and the water temperature. The quality of the espresso will depend on how well each step has been performed by either the individual or the machine. The more steps that must be performed manually, the more there is an opportunity for variations in the final espresso. Most of these steps can be mastered with experience and the variations may not be noticeable except to the very discerning. The ESE pod will improve the consistency by eliminating the grinding and tamping steps. The process time is the total time from the grinding of the coffee to the end of the extraction of the espresso. The process time is reduced with the use of an ESE pod. The usual rule that more features can equal more problems applies to espresso machines. HowToDecide would appreciate your feedback on any aspect of the Which type of espresso machine should I buy? Quick Decide Guide™.